May the Force be with you! And the galaxies too! Sega Toys' bestselling series of home planetariums just took a hyper speed jump of an intergalactic nature. 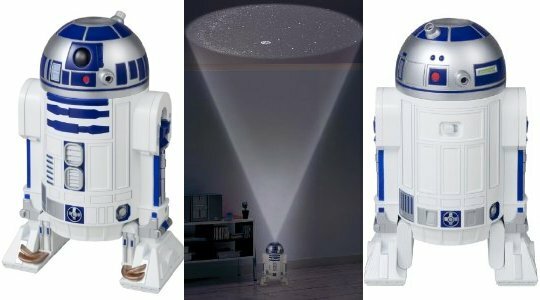 The latest addition to the Homestar range is none other than R2-D2, the most famous android from the world's biggest science fiction franchise, Star Wars! A sophisticated scaled replica of the film character, this home planetarium is ideal for boys young and old, and features around 10,000 stars that can be projected from R2's head out onto your ceiling. The new Homestar might have come from a place "a long time ago in a galaxy far, far away", but it still works in just the same way. Put in some ordinary household batteries and turn on the white LED light to gaze at the thousands of amazing constellations that sparkle in our night sky. What's more, R2-D2 isn't the only Star Wars character in this universe! Amongst the projected constellations, look closely and you will be able to spot the Death Star! Officially licensed by Lucas Film Ltd.